WPML & Localization ( .po .mo ) Ready! Please refer to end of this page on updates made. The download pack includes changelog.txt file with all details of changes and additions along with details of files. Unbranded theme options with advanced controls. Features Fullscreen slideshows with audio. 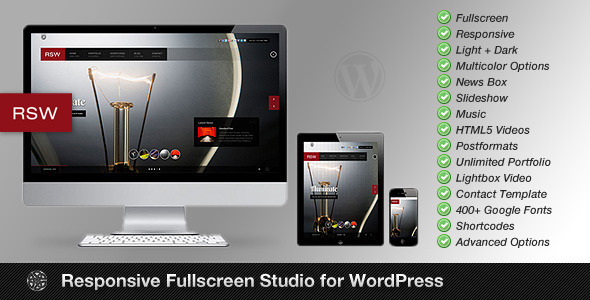 Video fullscreen playback fro Vimeo, Flash, Youtube and HTML5 videos. Homepage supports news blogs along with the slideshows. Fullscreen toggle clears other elements for best view of fullscreen slideshows. Portfolio includes a Horiztontal Slide scroller with captions support, and Galleria slideshows, both placed on background images with focus view toggle. A transparent fullscreen template where slideshow shortcodes and thumbnail galleries can be displayed nicely. Portfolio Galleria slideshow is currently generated by this template. For easy deployment and configuration the theme comes with an easy to follow PDF file with screenshots and explanations. If you need support for the theme do post in the item discussions. Fix - Uses correct template path for dynamic css file. Corrects issue for Child themes. Add - All style class additions are appended to End of File of style.css and style_dark.css commented with version number. Fix - Safari Mac version menu fix. Fix - Show mainpage fullscreen navigation for more than 1 slide. Useful to show a static image. Fix - Don't display thumbnail tray toggle when tray is switched off.